Over the past 20 years, My Classic Car (MCC) has become an icon in the specialty vehicle and collector car hobbies and our handlebar mustachioed host, Dennis Gage, is revered as one of the foremost automotive personalities. Every week, Dennis takes viewers to local car shows, amazing collections, and prestigious automotive events. MCC airs weekly on Motortrend, NBCSN, MAVTV, and Rev'n. These networks are dedicated to providing quality programming for the automotive enthusiast and MCC is excited to be a part of their lineups. If you want to target your advertising toward male automotive enthusiasts between the ages of 18 and 54, then Motortrend, NBCSN, MAVTV, and Rev'n are where you want to be. While our show provides television viewers with an informative and entertaining program, it also offers some unique opportunities for you to promote your company and products. Learn more about our advertising opportunities and watch video examples by clicking on the blue boxes in the image below. 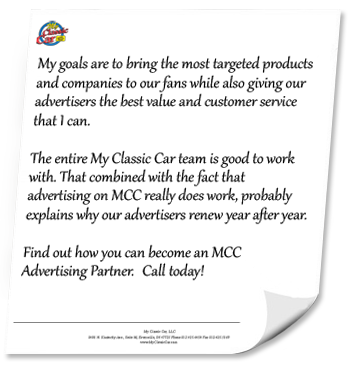 When MCC receives bonus airings, your advertisement will be included in these airings at no additional charge. All of our television advertisers also receive continual exposure on our website. There are approximately 15,000 unique visitors to MyClassicCar.com every month. At this time, we don't sell web advertising. Our website is reserved for our television advertisers. Television advertising packages start around $10,000.